WrestleMania 32 Was A Big Spectacle Bogged Down By Entrance Issues and Underwhelming Match Outcomes. Tens of thousands of people gathered at AT&T Stadium last night. Actually, it was 101,763 people if you believe the attendance WWE reported, which would set the record for highest attendance at any WWE event and fifth-highest at the Dallas Cowboys’ stadium. Regardless, there were people from literally all over the world, all in one centralized location to see the most spectacular wrestling event of the year. The only problem? Many of them couldn’t get in by the time the event actually started. AT&T Stadium looked like Mecca last night. There was a literal town’s worth of people gathered around an overinflated dome, trying to get in, and AT&T just wasn’t having it. There were several reasons theorized, but AT&T Stadium eventually said they were simply trying to ensure the safety of the attendees, which caused a delayed entry. That’s weird; packing up thousands of people and forcing them to trudge through narrow corridors in close proximity to one another doesn’t really sound safe to me. Alas, such was just the beginning of the running theme of the night, which was people just not really getting what they wanted, in spite of the spectacle. The night kicked off with what was actually the feel-good moment of the event. Zack Ryder won the seven-man ladder match for the Intercontinental Championship, albeit while a lot of fans were still finding their seats. For those unaware, Zack got insanely popular with crowds back in late 2011 and early 2012, but was promptly buried (read: they stopped showcasing him on TV) and forgotten about. But, last night, he was finally given another chance at the biggest show of the year. And to see him celebrating his title win with his dad in the ring made the fans pop huge. Unfortunately, that was pretty much the only sensible result the entire night. Then there was Dean Ambrose versus Brock Lesnar. This match had been hyped up for about two months now as a sure-to-be-insane bout. It was no-holds-barred, and Dean had been brandishing a barbed-wire bat and a chainsaw in promos for the last few weeks. So what happened? Well, Brock beat Dean in a little over 10 minutes, and Dean got in very little offense, never getting to use either of those weapons despite the teases. Once again, the crowd was left disappointed. There was also this really pathetic and obnoxious thing going on throughout the night where the WWE would instruct the audience with what to chant by putting words up on the big screen (like “Wooo!” for Charlotte, for example), a move that actually interrupted the stream of the match because the people in the cheap seats couldn’t see what was going on. The Hell in a Cell match between Shane McMahon and The Undertaker at least managed to deliver on its promises. As expected, the stunt-loving Shane engaged in a completely nuts 25-foot drop off the top of the cell through the announce table. For reference, that’s about five feet higher than the fall Taker gave Mick Foley when he threw him off the top of the cell. Somehow, though, Undertaker still won the match, meaning Shane’s entire storyline about calling out the WWE for its terrible business practices is now over, thus leaving The Authority to continue to run the company how it wants. As for the main event of the night? Roman Reigns versus Triple H for the WWE World Heavyweight Championship went exactly as expected, which is to say it was a disappointing final turn for the night. Triple H got a few cheers from the crowd as he came out dressed up in a ridiculous fantasy costume, and Roman Reigns came out to a wave of boos. Really: It looked like literally every person in JerryWorld was booing this guy. Making things even funnier, his fireworks went off late in his entrance. Also, the match started with a headlock, which doesn’t make any sense because these guys supposedly hate each other. In turn, the crowd quickly checked out into near silence for the next 20 minutes. There were a few big spots here and there that got the crowd back into it by the end, but as soon as Roman pinned Triple H for the win, it was right back to booing. And that’s how the night ended — with jeering as Roman celebrated alone in the middle of the ring. After the live broadcast cut off, Triple H and Stephanie McMahon shook a few hands and hugged some kids in the front row before walking to the front of the stage and pointing at the WWE logo on the ground. I guess this move was taken to remind the crowds who to be upset with? I’m not sure, but even in the face of star-studded cameos — Shawn Michaels, Mick Foley, Stone Cold Steve Austin and John Cena all made surprise arrivals alongside appearances from The Rock, Snoop Dogg and Shaquille O’Neal — many fans left the arena in a much quicker fashion than when they arrived, with a little less wind in their sails. Here’s hoping things go off better tonight as Monday Night Raw goes down at the American Airlines Center. The Raw after WresleMania has for years had a reputation of having some amazing moments — ones that sometimes even top ‘Mania itself. With pretty much the same crowd as last night — just in smaller numbers — the crowd, at least, is guaranteed to be top-notch. Whether WWE decides to give these people what they want is another discussion entirely. 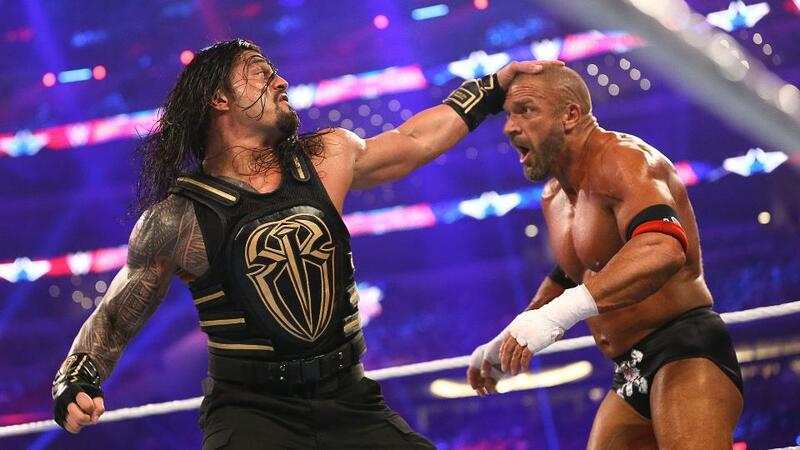 Cover photo of Roman Reigns and Triple H courtesy of WWE. Previous ArticleThings To Do On Monday, April 4.